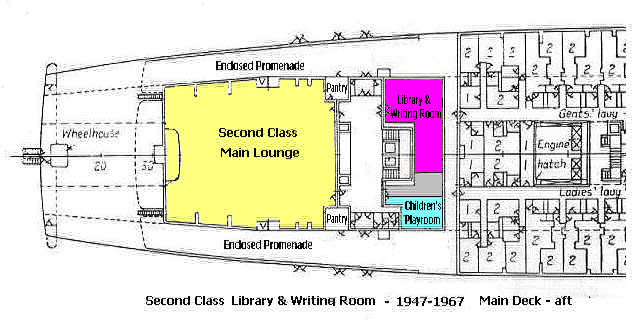 The second class library and writing room were located around the grand staircase at the back of Main deck. The elegance and the warmth of the original design illustrate the effort made by the Cunard White Star Line to ensure that the Queen Mary was "unsurpassed in second class." .."advantage has been taken of the L-shaped plan of the room to use one arm entirely for books , so that readers in the other portion of the room will not be disturbed by those searching for books. "The library...measures 20 ft. long by 10 ft. wide, and accommodation is provided in the bookcases for about 1,400 books. ...The book back are effectively illuminated by concealed lighting." "The general character of the decoration is subdued and refined, the mural treatment being in veneers of golden ash burr and bird's eye maple, with contrasting pieces in a curiously marked olive ash." The Second Class Library and Writing Room area as it was pre-war. Aft port side, M Deck. "Special attention has been paid to the altar, which is placed in a recess at one end of the room and concealed by sliding doors. A picture in oils representing "Our Lady of the Seas," by Mr. Kenneth Shoesmith, forms a reredos of great charm. The altar, when in use, is illuminated by concealed lighting." "The writing room is 26 ft. long by 19 ft. wide, and the decorative treatment here is similar to that in the library. On the outboard side are three large bays, each with three windows, and these are arranged to be vertically sliding and are illuminated from behind at night. A series of mirrors is positioned on the inboard wall to balance the bay windows, and sand blasted designs of semi-obscured glass are again effectively employed here." "The furniture of both spaces is finished in walnut burr, with inlaid metal work or silver bronze. Thick carpets are laid on 3/8 in. cork, with surrounds in oak parquetry by Messr. A.M. MacDougall & Son." 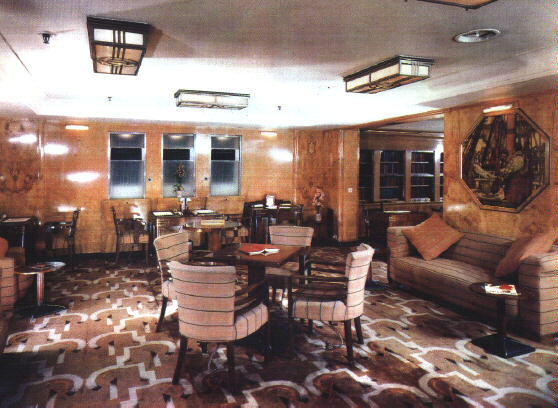 1936-1967 Throughout the service life of the Queen Mary (with the exception of during WWII when the ship was used as a troop transport) these handsome rooms retained their original function and furnishings. Periodically the upholstery was replaced, but when the Queen Mary came to Long Beach on December 9, 1967, these rooms were identical to the description above - with the original thick carpets still in place. The Library and Writing room and surrounding area, post-war. 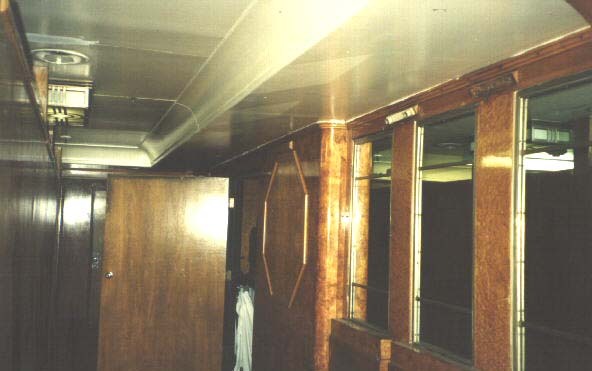 1968-1971 The initial conversion plan was to retain these rooms essentially as created and reserve them for the exclusive use of hotel guests - along with the adjacent second class main lounge. 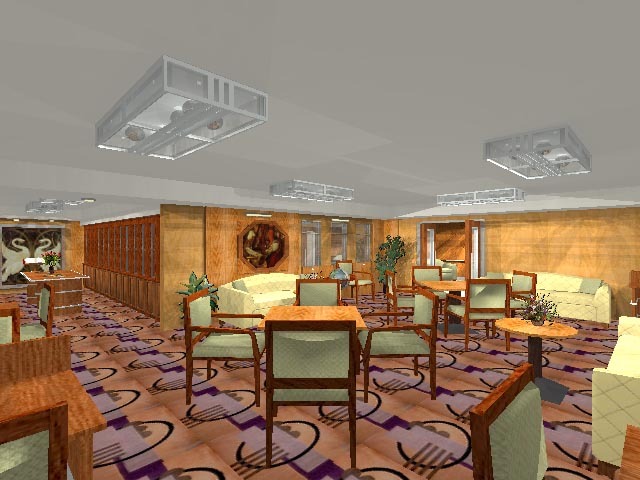 The second class main lounge had been given a truly hideous decor by Cunard in the 1960's when it became the "Flamenco Room" was to be restored to its 1930's decor and used as a combination lounge and dining room reserved for hotel guests. This work was in progress when Diner's Club, the master lessee for the ship departed -- prior to the opening of the Queen Mary to the public in 1971. 1971 to present With the departure of Diner's Club, the long delayed opening of the ship was propelled with a new lessee and urgency. His strategy was to open the ship for touring and banqueting services with minimal further investment. The opening of the hotel was delayed for several years. In the interim the partially restored second class main lounge was expanded by the destruction of its adjacent enclosed promenade spaces and turned into a catering banqueting/ballroom. It has retained this function to this day. 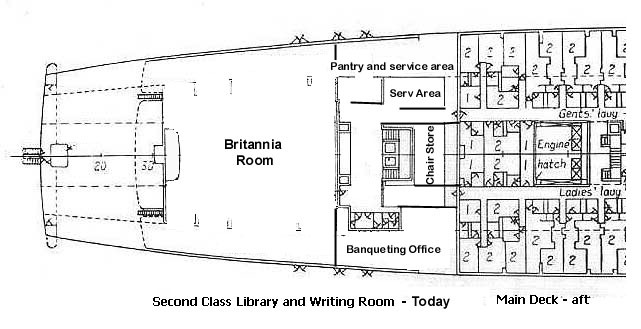 The second class library and reading room spaces were pressed into services as chair storage and pantry spaces to support banqueting in the newly named "Britannia Room." The devastation that has resulted is obvious in the photographs. The Second Class Library and Writing Room area as it is now. This room contained 3 paintings by Kenneth Shoesmith, now moved from here. 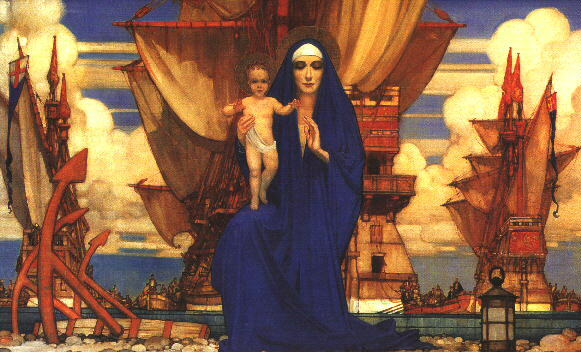 Madonna of the Tall Ships (Our Lady of the Seas as described above) is now in the museum on the ship, and the two smaller paintings have been moved to meeting rooms. 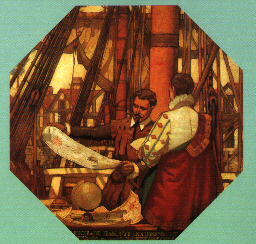 Octagonal in Shape, the two small pictures called "Samuel Pepys at the Royal Dockyard, Deptford" and "Richard Hakluyt Recording the Voyages of Elizabethan Sailors" (now known to be a post-war recreation of a lost original) were actually cut from their frames with a carpet-knife during their removal in the late 1980s. They are now in part of what used to be the Long Gallery. 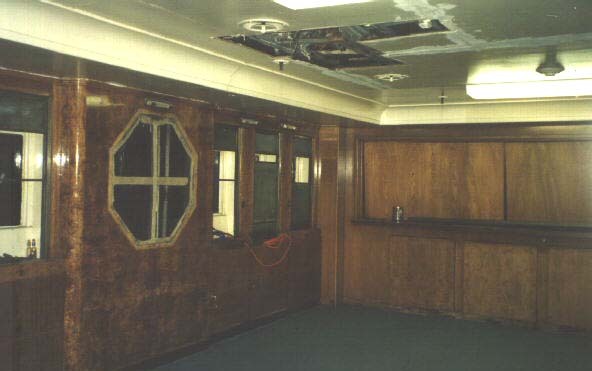 The Octagonal frames can still be seen in what remains of this room which is at the aft of Main (M) deck just beyond the end of the Hotel corridor on the port side. The room has been used for storage and has been cut in two by the extension of the hotel corridor. 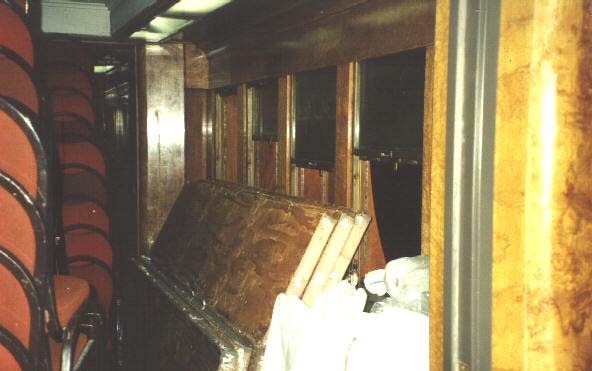 The part of the room which is at the center of the ship is most often locked off, but still contains the bookcases on its walls, almost completely intact - but missing the books of course. 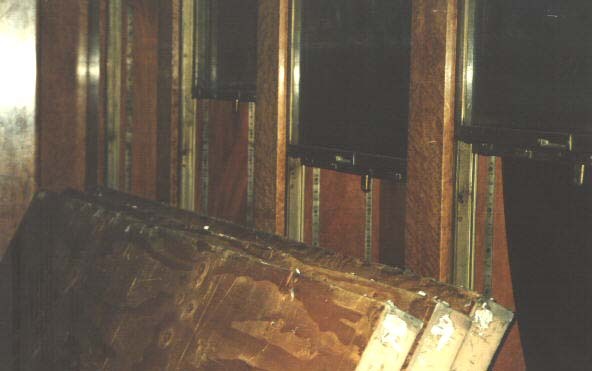 The bookcases had glass panels underneath them which could be slid up over them to keep the books from falling out in heavy weather. 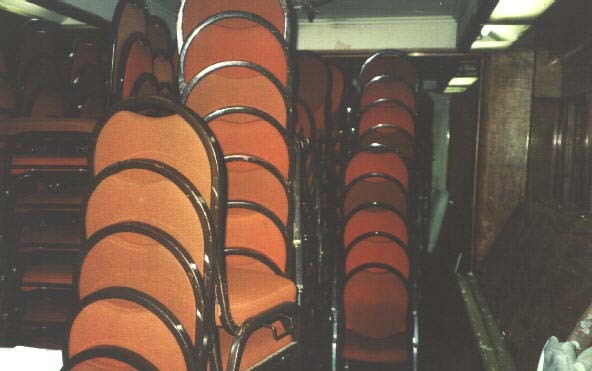 Similarly, you can see ties underneath the chairs in the picture above showing the room as it was. These stopped the chairs from sliding too much in storms. These pictures of the library as it is now are hard to understand, the room has changed so much. The section of the library which remains in the center of the ship today. The room is filled with chairs from the Britannia Room. These are moved in and out of the old library as occasion demands. The main section of the Library whilst empty. The wall on the left is on the port side of the ship. 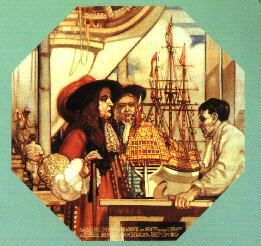 The Octagonal frame remains on the wall from one of the Shoesmith paintings. (It is opposite the painting in the 1940s shot above). The Octagonal panel on the wall here is the one in the 1940s shot above. You can see where a new wall has been put in on the left of this corridor because it skirts the light fitting (original) on the ceiling. This is the light furthest from camera in the 1940s shot. Inside the center-ship part of the room today. The shelving from the library still retains its glass sliding screens. Close up of the shelves. Possible Future layout of this area showing a restored / adapted Library and Writing Room. Two renderings by Jeff Taylor of the room as it might be reconstructed. Anyone who has stayed at the Hotel Queen Mary realizes the need for amenities reserved for hotel guests. At this writing (January, 1998) there are virtually no original public rooms reserved for hotel guest use. The gracious amenities found in most fine hotels and even upscale bed and breakfast establishments -- complimentary newspapers, a lounge area where coffee and tea is served in the morning and complimentary wine and cheese are served at dusk -- are not found on the Queen Mary, once a world class icon of hospitality. 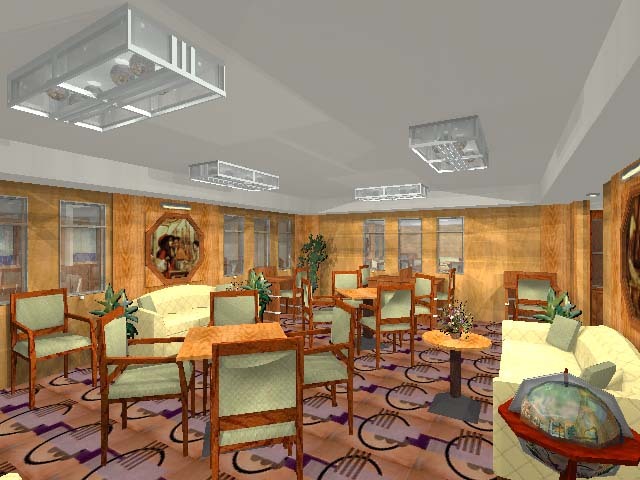 The restoration of the second class library, reading room and adjacent second class main lounge as amenities reserved for hotel guests and Queen Mary Club members would be a major step in improving the caliber of service at the Hotel Queen Mary.